With a Platform, one wall and a partial roof with lights, this is by far the most popular cabin style installed in domestic situations. 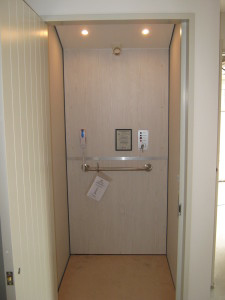 It is ideally suited to lifts that have their entry/exits points in different orientations at the different floors. A safety handrail, key isolating control, alarm button and telephone are all standard features fitted in the cabin. For a feeling of better security, the 3 walled cabin has a full ceiling with a safety hatch and double LED lights. A safety handrail, key isolating control, alarm button and telephone are all standard features fitted in the cabin. This model is not suitable lifts that have their entry/exits points in different orientations at the different floors. 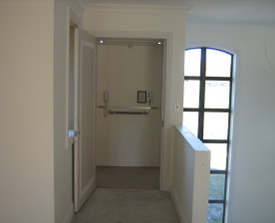 The standard height of the cabin is 2000mm but can be manufactured higher to suit the doors fitted at the landings. Note:Ther needs to be a minimum of 200mm clearance in the lift shaft ubove the top of the upper door. level, we can provide a platform with a part height wall. The lift mast is protected with a fixed timber barrier. A safety handrail, key isolating control, alarm button and telephone are all standard features fitted in the cabin along with lighting. 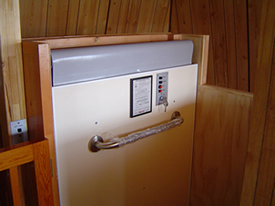 This style of cabin is restricted to lifts with a travel no greater than 3000mm. This offers the same features as the Timber barrier but has a roller blind fitted to protect the lift mast assembly. 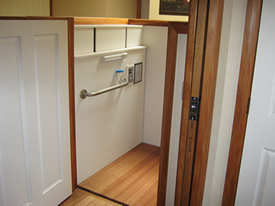 This style of cabin is restricted to lifts with a travel no greater than 3000mm.